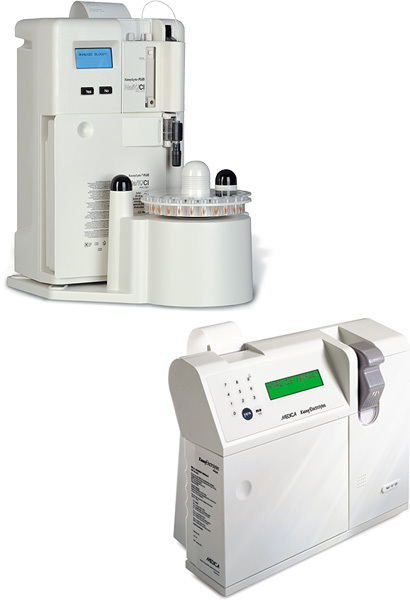 Medica’s electrolyte analyzer products are specifically designed to meet the needs of small to medium-size laboratories. EasyElectrolytes™ and EasyLyte® analyzers both feature yes/no prompted operation, simple maintenance, fast results, and a low cost per sample. Incorporating the latest technology, Medica’s electrolyte analyzers improve lab productivity, while delivering sample results economically. EasyLyte is a completely automated, microprocessor-controlled analyzer that uses advanced ISE (Ion Selective Electrode) technology to make electrolyte measurements. EasyElectrolytes meets the laboratory’s need to deliver fast results with minimal use of calibrant.